Sony PlayStation Vue to 'reinvent television experience' | What Hi-Fi? With the growth of online video streaming opening up more ways to watch live and on-demand television content, it's no surprise that manufacturers are lining up to take advantage – and the PlayStation is the latest platform. 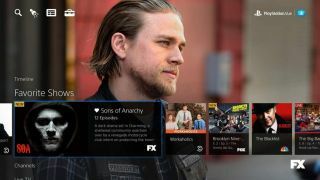 Sony Network Entertainment International and Sony Computer Entertainment have announced the launch of PlayStation Vue, a new cloud-based service that promises to transform how we watch TV. The service is soon to be made available to selected PS3 and PS4 owners as part of an invite-only beta mode this month, with Sony promising an extensive selection of live, on-demand and catch-up TV content to watch. According to Sony, PlayStation Vue "immediately" connects you with the content you want to watch. It'll let you access your favourite shows and channels, while also making recommendations on your viewing habits. With the Search function, you can filter results "quickly and intuitively", while the Explore function is designed to let you go through the entire library of content using different criteria – such as ratings, genre and more. You'll be able to save your favourite programmes to the cloud without any restrictions on storage or scheduling conflicts for a 28-day period, and you'll be able to catch-up with any content shown during the past three days. At the moment, it seems as if the service will be restricted to the US judging by the current network partners – ranging from CBS to Discovery, Fox to NBCUniversal and Viacom. The initial roster over the pond will offer around 75 channels. The beta mode will be made available in phases, starting with New York and followed by Chicago, Philadelphia and Los Angeles. It'll also be made available on other devices too. A full launch is set for the first quarter of 2015. We'll be keeping our ear to the ground to find out if and when the PlayStation Vue will be making its way across the Atlantic. But, for now, we'll be able to toast the UK launch of PlayStation TV set-top box – due to make its debut tomorrow [14th November].